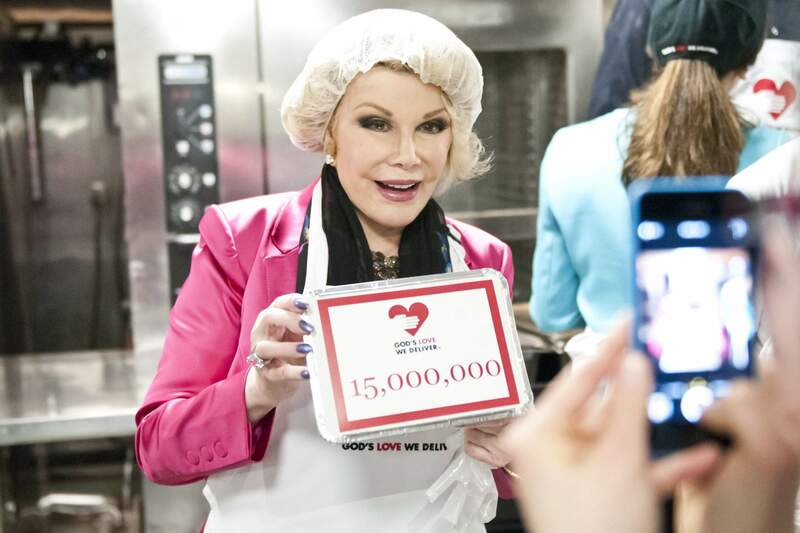 God’s Love We Deliver is delighted to announce the establishment of the Joan Rivers Memorial Fund. The fund has been seeded with inaugural gifts from Michael Kors and John Demsey/The MAC AIDS Fund. As you know, Joan was a huge supporter and gifts to this unrestricted fund will help ensure that we can always hold to our core principles: we will never have a waiting list and we will never charge a client for their meals. For years, she supported the Race to Deliver, bringing her energy, voice and laughter to Central Park on those early November mornings to support our runners, teams and friends. 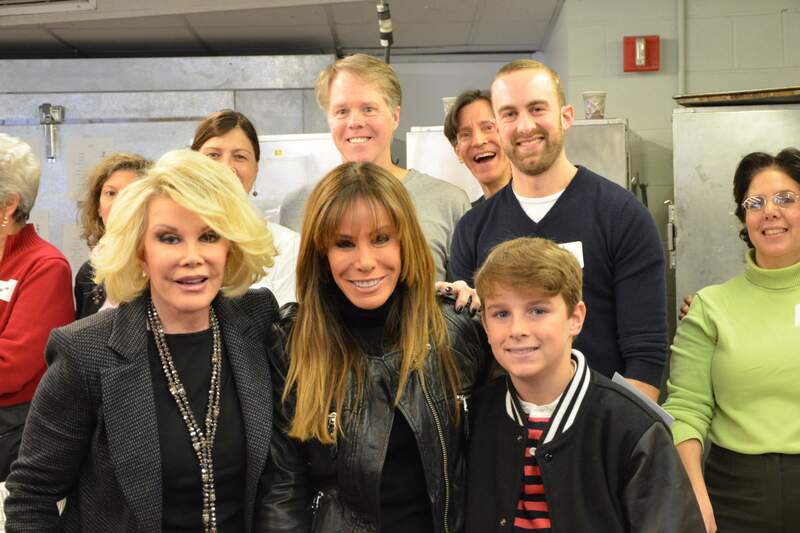 Joan volunteered every Thanksgiving, bringing her daughter Melissa and her grandson Cooper with her. Each year, she delivered holiday meals to our clients, surprising them with jokes, bringing warmth and care and brightening the holiday for so many. In 2009, she won over $500,000 for God’s Love in the NBC reality competition, Celebrity Apprentice. 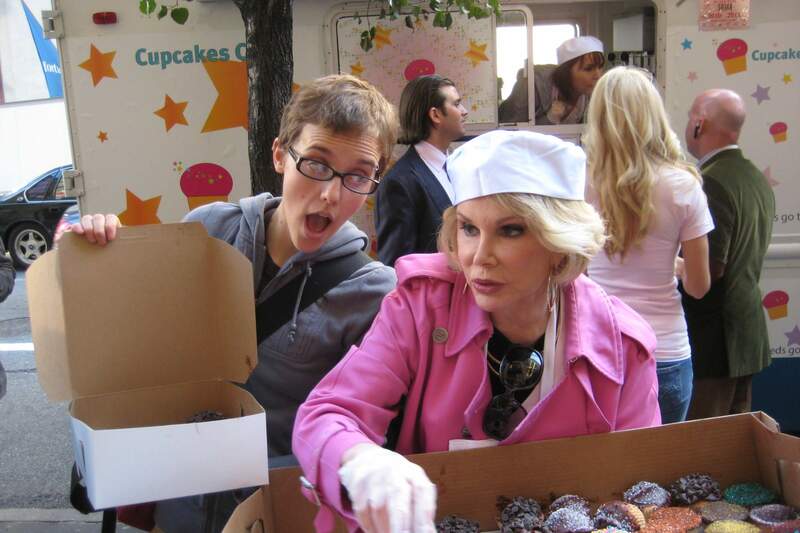 Joan brought love, compassion and humor to every delivery she made and every event she supported. Joan’s impact on God’s Love will be felt always by our clients, volunteers, staff and supporters. We are thrilled to announce that Melissa Rivers has joined our Board of Directors, continuing her mother’s legacy and commitment to the clients she was so dedicated to serving. We celebrate our many years with Joan, who will forever be in our hearts. At the 2014 Golden Heart Awards, we premiered our tribute video to Joan Rivers. In September, God's Love We Deliver lost Board member, former Golden Heart Award recipient and great friend Joan Rivers. After 27 years of amazing service and support to God's Love, she will never be forgotten. With each person who joins the God’s Love Birthday Bake Sale and sponsors a cake for $10 each, we will make sure that thousands of New Yorkers living with serious illnesses don’t feel alone on their birthday. Our special holiday meals are delivered with love, to make sure that each and every one of our sick clients knows that someone cares. Share the spirit of the season, and please sponsor a holiday meal today! Breakfast makes a difference, and so do YOU, when you sponsor a breakfast for a young child in need. It’s only $5 per breakfast, or $25 per kit to last a whole week. Thank you!